8.48 points at 40 votes (rank 28). In Orwell's famous year 1984, William Gibson released his debut novel of the same name which became a cult classic. In 1988 the video game adaptation of the book was released by Interplay. 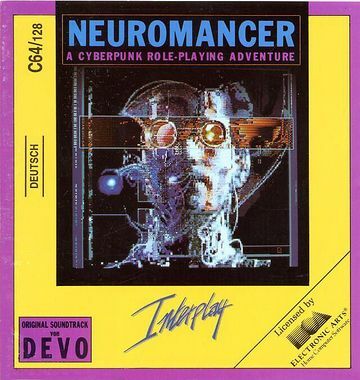 Neuromancer is one of the first computer games which was specifically written in the Cyberpunk genre. Just as the book was, the game was awarded several prizes because the 'The Bard's Tale' developers had created a fascinating graphic adventure with role playing elements. While the plot and the main character of the game are different, various places and persons from the novel appear in the game. The main character, who is mainly controlled with a set of menu icons, is either in direct control mode (i.e. able to move around in the game world) or talking to another character in a kind of multiple-choice fashion; the player character is using its inventory; the player may access purchased skills relevant to the storyline like 'Debug' or 'Hardware Repair' to carry out tasks which are usually invisible but affect the story in direct ways. Past a certain point in the story the player character may acquire a ROM Construct, a recording of the mind of a dead non-player character who advises the player in certain situations or carries out certain tasks. There is also a PAX service which provides access to the player's bank account and news, and allows certain kinds of business to be carried out. 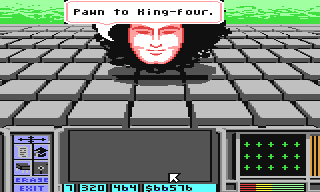 The PAX service also provides a form of copy protection for the game: The PAX is essential for initiating certain plot-relevant tasks and accessing the player's bank account, but it can only be accessed after entering three numerical values from a code wheel. Without the code wheel, the storyline cannot progress. The player character is in Chiba City, Japan, a highly uncomfortable concrete jungle of the 21st century. The hotel rooms are slightly larger than the size of funeral coffins and the sale of one's own organs for money is a daily occurrence for the destitute. The town is controlled by huge corporations whose computer networks links together to form a secondary world: Cyberspace. 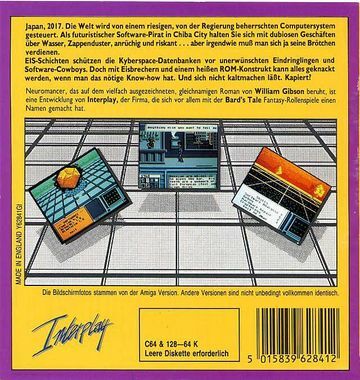 Cyberpunks operate between this realm of data and the ghetto of the "normal" world with their cyberspace decks (computers). The more qualified a Cyberpunk is, the greater are their abilities to travel around in Cyberspace regardless of passcodes in their posession and not having access only to the public services (PAX). In this game you find elements from several genres. It is a combination hacker simulation with role playing, action and many adventure elements. The atmosphere of the book was well carried into the game, the dialogue and BBS messages are written very well and contain a good portion of humor. The controls are easy to learn as the joystick is used mostly, but speed can be of the essence so learning to use the keyboard is preferable. One can easily have a divided opinion on the design: Chiba City does not seem like the concrete jungle described in the novel, but rather a newly cleaned up (and out) town. The flow of the game seems slow due to the slow walk of the character and the frequent disk swaps. On the other hand the plot of the game is complex and engaging and the puzzles are not easy to solve. By rereading the original novel one may gain a small bit of insight into the puzzles but you will find only a very small number of solutions. When you explore Chiba City every place corresponds to one screen. Many places have exits by which they can be left. Exits at the lower rim of the location are marked by a hard-to-see grey line, especially streets have often this feature. Some doors are locked or watched and you need to find a way to unlock or otherwise get through them. While you explore other places you will find other people to talk with. During a conversation speech bubbles appear above the person you are talking with. You can use either the joystick or the keyboard to control the game. The screen is divided into three main windows. The largest window shows your current location, the lower left window contains the status bar and command icons, and at the lower right there is a text window for room descriptions and other text output. You can use the joystick to move the cursor (arrow). If you want to choose an icon, a menu option, an item or other option from a list, move the cursor there and press the fire button. To move in the real world, click on the "Move" icon and then control the character with the joystick. It can also be moved with the keys O : L K . To leave the moving mode, press the fire button. To speak with NPCs in conversation mode, choose the "Talk" icon or press the T key. A conversation basically consists of selectable questions and answers. By moving the joystick or pressing the spacebar you can flip through the questions or answers and confirm what you want to say by pressing the fire button or the "Return" key. Some questions need to be more precisely stated by supplying a keyword (e.g. "What do you know about ---"). For this you need to type the keyword you want to ask about with the keyboard and confirm with "Return". A conversation can be aborted prematurely by pressing "Run/Stop". If you use a PAX terminal (by clicking the "PAX" icon or the P key) the terminal will give you three codewords and ask you for a verification code. Line up the codewords on the code wheel (contained in the original package) and enter the number you find. To confirm, press the "Enter" key. Cyberspace jacks appear in locations as yellow circles with red dots in them. For example, you will find a jack in the Gentlemen Loser and at the Cheap Hotel, but there are connectors for other zones in other places. Each cyberspace jack will connect to only one zone; Cheap Hotel's is limited to Zone 0, the Gentleman Loser's to Zone 1. In Cyberspace the upper half of your view is your current position in Cyberspace, in the lower left are the command icons, and in the lower right is your EEG monitor which shows you information on your brain activity. Below the EEG is a gauge displaying the damage of your deck can take before your brain starts to fry (if your deck doesn't provide much protection ICE will harm your arsenal of warez and your Constitution stat). To the right of the EEG there is the display of the damage your enemies (ICE or an AI) can withstand during a fight. Between the icons and the EEG there is a field in which text appears if necessary. 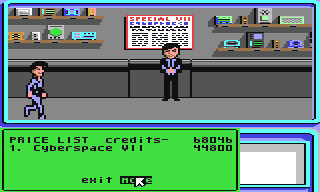 Below that there is a status bar with 4 pieces of information, from left to right: Cyberspace zone number, your X and Y coordinates in the grid, and the money left on your credit chip. Mode switches between the displays "Date", "Time", "current balance on the credit chip" and "your current constitution"
Inventory shows what items your currently use. You can "use them", "put them down", "give them to a person" or "delete software on the deck". PAX access to the PAX system, if there is a PAX terminal in the room. Talk talk to a person in the room. Skills choose a skill that you own. Inventory shows a list of softwarez (programs) that you can use. Exit leave the Cyberspace (also during the fight against ICE). The best way to start your search is to find basic hardware - your deck - and the software needed to get access to the public computer network. If you look around a bit in your PAX messages you will find out where you left your deck. You can upgrade your hardware and software in several locations around the city, but for this you need money. Better equipment means better reliability and the ability to install and use more software, but of course the price rises correspondingly. 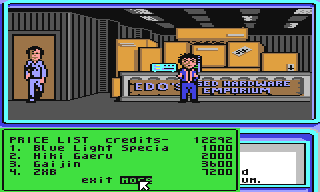 Most people in Chiba can only afford low quality equipment from second hand shops like "Crazy Edo's Used Hardware Emporium", but serious Cyberspace cowboys buy at "Asano Computing", the only local vendor that sells fully equipped Matrix simulators, so-called "Cyberspace Decks". Normal Comlink access requires the use of a Cyberspace jack which are scattered throughout the city. With a basic desk and Comlink software you can use these connectors to get access to some computer systems on the whole world. If you know the Comlink access code for a system you can reach it with the correct version of the Comlink software. Only lightly secured systems need Comlink 1.0 for access, but companies and government systems with higher security need Comlink 4.0, 5.0, or 6.0 to make a connection. Remember that Cyberspace jacks are used for both Comlink and Cyberspace access. You can buy some Comlink software but you will have to figure out where to acquire the more advanced versions. Some computer systems are secured by passwords. Some systems tell you the passwords in the welcome message, but you need to find out most of the passwords by yourself. Some of those passwords are additionally encrypted so the Cryptology skill chip has to be used to decipher them before use. Some encrypted passwords cannot even be broken with the Cryptology skill chip. Rumour on the street has it that it is sometimes possible to sidestep the password protection of low security systems with a new type of software. After gaining entry to a system you have access to all of the data and software corresponding to the security access level. Some systems have different security access levels, and every level needs its own password. If you enter the same system at a higher security access level you will be able to read more contents of the database, including secret information and valuable software. The fee for the Comlink access time is automatically subtracted from your credit chip, so the time you can spend connected is limited to the amount on your credit chip. As long as you are connected to the database time passes at the same rate as in does in the "Real World". After buying a Cyberspace deck you can dive into the Matrix (also called Cyberspace). Separate from the normal end users who are limited to the basic functions of the Comlink system, you see the Cyberspace net with all of the information in its basic form. All systems of private persons, companies, governments and the military can now be reached; some can only be accessed from Cyberspace because they have the most sophisticated security. Visually, Cyberspace is shown as a 3D grid in which systems are seen as geometric shapes. These systems are found in specific zones of the Cyberspace grid. The visuals of Cyberspace are actually a highly simplified interpretation of data projected directly into the brain of the user through the deck, without which a human being would never be able to understand due to its extremely density and complexity. As a comparison you can imagine driving in a town. The streets correspond to the lines of the grid. The buildings would be the system's geometric figures and your means of transport is the Cyberspace deck. You can stop at a "building"/"geometric icon" and enter it to get access - if you can bypass the guard. Just as in the Real World you cannot just enter a system from Cyberspace. Every computer system is protected by software and hardware - ICE (Intrusion Countermeasures Electronics), which is designed to keep unauthorised users from entering a database. ICE can also be deadly. Computer systems are protected by ICE (Intrusion Countermeasures Electronics) — today what one might call a firewall or an Intrusion Detection and Prevention System, which is a semi-intelligent barrier that is supposed to repel the intrusion attempts of cowboys. But, as the forbidden is always the most interesting, cyberpunks try again and again to overcome these barriers with their specialised ICE-breaking software. The trick is to find the right version and type of software and use it before the ICE starts its attack cycle. There are subtle, slowly working viruses that sneak up on the core of the ICE, but there are also brute force programs which try to punch through one or more layers of ICE in one go. Many different types of ICE breakers can be found; some aren't particularly useful while others are ingenious and highly effective. It is your task to find out the effectiveness and mechanism of attack of each type and version. You will also notice that systems with relatively low security are also secured with not very effective ICE. By testing your ICE breakers on lower security systems you can broaden your knowledge in relative safety and train for more dangerous missions. This is also useful because ICE is adaptive, and the more you use a particular ICE breaker against a system the less effective it is. Another minor detail must be mentioned. ICE has the annoying tendency to counterattack. In fact, it can kill you! Some computer systems have a second line of defense, an AI. The origins of this technology lie in the 20th century when they started to simulate human intelligence with computer programs. Modern AIs develop real personalities. Especially programmed for the military and megacorporations that can afford them, AIs have mental abilities which dwarf by orders of magnatude those of their developers. Amongst other things, AIs run megacorps and develop the ICE which protects the computer system in Cyberspace. Due to the potential danger of such vast intelligences, the governments created an agency to keep the AIs under control. The Turing Registry has the responsibility of controlling developments made by AIs and avoiding that any one AI can develop into an uncontrollable super-intelligent program. Normally this is impossible for one single AI but it is possible if several AI cooperate. As soon as a new AI has been developed the creators are bound to register its name, serial number and nationality with the Turing Registry so it can be kept under constant surveillance. The Turing Registry also keeps an eye on people who illegally help AIs. AIs are perfectly capable of protecting themselves. Most cyberpunks avoid fights with these entities because ICE breaking software cannot harm them. The attack of an AI is a unique experience. Surviving cowboys report that such an attack goes straight to the brain. The AI gives the brain of the victim a neural shock, which makes brain activity stop long enough that the rest of the body functions stop as well. Rumours say that there are skill chips which allow mental combat against AIs. Until now nobody has survived long enough to speak about details of them. McCoy Pauly, the cowboy once known as the Dixie Flatline claimed that he had run into AIs in three different systems and only survived because he had found a weakness in each. Whoever helped him or whatever he used to exploit those weaknesses has never been found, but it was able to rescue McCoy three times from Cyberspace while he was flatlining, but the fourth time it was too late and Pauley's luck ran out. 1) There are many cyberjacks available in Chiba City, but most of them are limited to one zone. You are limited to the grid inside of this zone. 2) In Chiba City many things are free, but the use of a Cyberspace jack costs money. If your credit chip goes empty, the connection is interrupted and you find yourself back in the real world. Under some circumstanes this can be extremely handy, but most of the time it isn't. A broke cowboy is a stuck cowboy. 3) Your current cyberspace deck won't let you store all of the warez you need (even if you delete older versions) or its shielding is inadequate to protect your brain and arsenal during combat. 5) None of the cyberspace jacks you have easy access to will reach far enough ito Cyberspace to proceed, in which case you need to figure out what to do. Cyberspace decks are extremely expensive. Shielding: Cyberdecks have a built-in firewall that protects the deck and the software from attacks of ICE. RAM limitations: In both types of decks the operating system and applications are kept in RAM, but the limits are higher in a Cyberdeck, i.e. one can install more applications. The best decks, e.g. the Ono-Sendai Cyberspace Seven can manage up to 25 programs simultaneously. But there is also software that can only be used once and will then delete itself. ROM constructs: These are highly illegal and are not available for private users, Cyberspace cowboys, or even most megacorporations. Each ROM construct is an upload of the contents of an individual's mind; it is essentially that person represented as software. It contains the person's personality, individuality, knowledge, memories, and skills. Only the most sophisticated Cyberdecks have a slot for a ROM construct. In Chiba City you can purchase abilities in the form of skill chips. They are plugged into an interface socket that is connected directly to your brain and gives you permanent access to special types of knowledge. For example: The Cryptology skill chip gives you the ability to decipher encrypted passwords. There are skill chips for many types of abilities, from foreign languages to high-tech knowledge or extraordinary abilities unique to Cyberspace. Abilities can be improved through tutorials found in computer systems or that are provided by certain inhabitants of Chiba City. Some skills are also improved by using it often. Generally one can say that skills raise your chances of success in both worlds, the Real World and in Cyberspace considerably. Once learned, a skill stays with you forever. 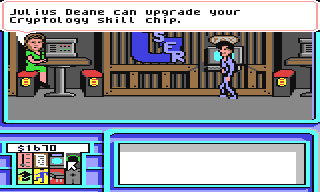 If you want to use a skill in a room of the Real World you need to insert the chip BEFORE you enter the room in which the skill should be used, or before you talk to a person on which the skill should be used. You can cause yourself problems if you don't. Coptalk: Used in the Real World to talk to police or question different people. Bargaining: You should use this in the Real World before you buy something as this skill can bring down the price. But there are also other people who have this skill chip so this skill does not always help. Software Analysis: Tells you the function of any type of software you happen across. Debug: Repairs faulty warez in your deck. Hardware Repair: Locates and repairs hardware problems in your deck. ICE Breaking: Used in Cyberspace before a fight with ICE. With this ability you can identify vulnerable spots in the ICE and makes your ICE breakers and viruses more effective. You will also find other skills, but you need to find out yourself what they do. The Body Shop in Chiba has two important functions: First, you can sell your body parts and organs for money and cheap replacements. Second, you can be reanimated if you die and it's not too badly damaged. Reanimation is expensive and requires all of the money on your credit chip. Therefore, you should always keep the biggest part of your riches in your bank account. Replacement body parts have a shorter life span and impact your constitution stat negatively. This makes you much more vulnerable in combate with ICE and AIs, and you probably won't be able to progress very far into the second zone of Cyberspace. Some body parts can be bought back later at a higher price. An indispensable means of communication. 1. First Time PAX User Info: A short history about the PAX network. 2. Access Banking Interlink: After choosing this option you will be shown the online banking menu. Your name and BAMA account number are displayed along with the amount on your credit chip and the current balance on your bank account. With the option DOWNLOAD CREDITS you can transfer money to your credit chip. With the option UPLOAD CREDITS you can move money from your credit chip into your account. The option TRANSACTION RECORD lists your four last transactions. 3. Night City News: With this option you can read the online newspaper of Chiba City, Japan. To read an article choose one of the listed headlines. The option MORE is used to list further headlines which do not fit onto the first page. 4. Bulletin Board: This option leads to the private message system of PAX. Here you can read messages or write to other persons. The Bulletin Board system seems to look for certain keywords in what you send that trigger responses from NPCs. The following examples use the keyboard controls. Of course you can also use the joystick but it's not as fast, and that can make a difference. If you are in a room with a Cyberspace jack and know already some link codes to databases you can use your deck to log into the database (if you have an adequate level of the Comlink software). Choose "UXB" or whatever the deck you own by pressing the corresponding number on the list. The Operate/Discard/Erase menu appears. Press the O key to operate the deck. A list of software is shown. Choose the Comlink software with the highest level (e.g. Comlink 1.0). You are prompted to enter the Comlink code for the desired database. Enter the Comlink code. A correct code (such as "CHEAPO" for the Cheap Hotel database) with the adequate level of the Comlink software will open the database. If you enter a wrong code, you can go on trying until you press the return key. If you make a mistake while entering, press the backspace key and overwrite the wrong letters. Press the SPACE bar to leave the welcome screen of the database, then enter the password when you are asked to do so. Choose your Cyberspace deck by pressing the corresponding number in the list. The Operate/Discard/Erase menu appears. Choose the Comlink 6.0 software. Comlink 6.0 offers a choice to enter a link code or to visit Cyberspace. Choose the option "Enter Cyberspace". Your screen will change to a simplified display of Cyberspace and the controls of your deck. Your initial position is determined by the location of the connector. If you use the connector in the Cheap Hotel, you will enter the Cyberspace next to the geometric shape which represents Cheap Hotel's network. Enter the number of the item. The Operate/Discard/Give menu appears. Press the G key for "Give". If you have chosen "Credits", the amount of money on your credit chip will appear with the question "Give how much?" Enter the amount that you want to give, followed by the return key. The amount is subtracted from your credit chip and given to the person in the room. Enter the number of the Skill Chip. The Operate/Discard/Give menu appears. Press O key to implant the Skill Chip. The chip disappears from the inventory list and is now ready for use in your Skills menu. You can now call up the skill over the corresponding icon. Press the S key for "Skill". Your implanted skills and their levels are shown. Choose the desired skill by pressing the corresponding key, in this example "Cryptology". The Cryptology window appears and asks you for a word that should be decoded. Enter the word and press the return key. The answer is shown. If you are in the software library of a database, a list of programs that you can download to your deck, is shown. For this just choose the corresponding number. A "Download Complete" message is shown when the download is complete. The software is now available for use. Press the I key for Inventory. A list of the available software is shown. Choose the desired software by entering the corresponding number. Press the R key for ROM construct. The ROM construct options menu with the menu items Software Debug / Software Analysis / Monitor Mode appears. If you choose the option Software Debug or Software Analysis you use the abilities of the ROM construct in these areas. After choosing one of the two options the list of software is shown. Choose the software that you want to debug or analyse and the ROM construct starts its work. The monitor option must be switched on if you want the ROM construct to follow your current activities. This is useful if you are in a phase that needs your full attention and you could overlook other important circumstances, such as your impending death. The ROM construct will not hesitate to inform you about that in monitor mode. Press the I key for Inventory. The list of items is shown. Choose your deck by pressing the corresponding number. The Operate/Discard/Erase menu appears. Press the E key. A list of software that is on your deck is shown. Press the number of the software that you want to delete. The software is now deleted permanently. The only way to get this software back is to download it again from where you got it in the first place. Save your game status often, especially before visiting Cyberspace. You can die fast in this game. Reanimation in the Body Shop has only financial consequences, but if you go bankrupt you won't be able to finish the game (easily). Read everything. Really, read everything you see and write down numbers, codes or link names. Almost everything is needed somewhere. Take notes on conversations, too. Map cyberspace thoroughly. There are things hidden out there which aren't alluded to anywhere in the text. An AI that you have defeated does not reappear when visiting the database again, but the ICE is rebuilt. During combat with ICE or an AI, time freezes when you have a menu open so you can take a breather and plan your next move. The controls by keyboard are faster and more precise. If you read through the AI's message buffers you will notice that some of the AIs seem to be communicating with one another. Important plot points are found in these messages so don't skip them when you raid databases you've broken into. Many puzzles in this game can be solved in different ways. You are not fixed to a rigid course. Example: There is a Cyberspace connector for every zone of the Cyberspace, but there is also the possibility of bypassing the borders between the zones. Some plot elements that seem pointless or dumb can be important later. Don't insult anybody, they can make life difficult for you. Don't be afraid to screw somebody over if you need to. Rest assured, they're doing it to someone else. If you get frustrated, don't be afraid to end the game and restart from an earlier save. Take a break when you need to. The game will be there later. 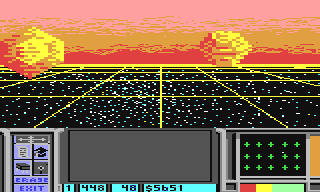 Take closer look at the savegame 4 of the version Neuromancer_(Frontline)_Side_1.d64 to _Side_5.d64 from C64-Games.de. The end phase of the game has still some surprises, puzzles and light bulb moments in stock. Until you reach the KGB database you are not allowed to make even one mistake when using a skill or a software. From this point you will need less strategy and more combination skills by the unique ICE-breaker software of this database and the end fight against Neuromancer has again some surprises in stock. The following ending is worth seeing, As an evaluation, I can only say, that I only wanted to test the game shortly and then after four days I somehow escaped the Cyperspace, after completing the game. Despite the somehow tenacious gameplay, which originates from the many disc changes and the slow movements in the real world, it is an above-average game. The version Neuromancer_(Frontline)_Side_1.d64 to _Side_5.d64 from C64-Games.de (needs no code-wheel, just enter SPACE and then press RETURN at the PAX query) was played through and seems to work without errors (HtW). This page was last modified on 6 July 2015, at 06:14. This page has been accessed 20,192 times.